I’m not very sure if I’ve talk about this sometime back but with the latest updates they have caried out to the product I wanted to bring this software back to your attention. System Center Advisor is a “Free” (Yes now it is free folks ) cloud service that enables IT pros to proactively avoid problems from server configuration issues. Apart from that for the customer who deploy System Center Advisor get the ability to retrieve reports about the servers current status and also historical configuration data about the servers. Microsoft pools their knowledgebase about the best practices and compare it against your servers to advise you in case if you have misconfigured the servers. 1. Go to www.systemcenteradvisor.com and register yourself and create an account. 2. Downlaod the agent software and unique certificate. 3. Select a machine as a gateway to connect with Microsoft cloud service an send and receive server related information behalf of the machines in the DMZ zones. 4. Install the agent to all the servers you want to monitor and mention the gateway server name during the setup. Recently Microsoft announced System Center Advisor can be linked with System Center Operations Manger as well. what this means is if you have in house SCOM deployed you have a way of getting System Center Advisor ongoing assessment of configuration information to the SCOM console. To get this working you need to have SCOM 2012 SP1 with Update Rollup2 installed in your environment. You can download the connector from here. 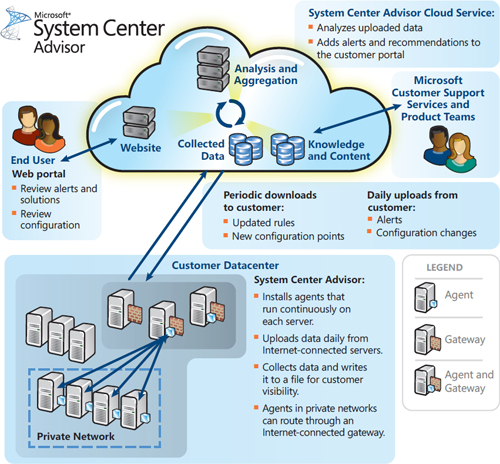 Note: System Center Advisor overview picture retrieved from TechNet page.